Trailing to the Atlanta Hawks since the second quarter, the Orlando Magic rallied back to send the match to overtime. They then defeated the Hawks 110-106 in a gritty victory Tuesday night. After starting the season with an 8-4 record, the Magic then went on a nine-game losing streak throughout November. Sitting at 11th in the Eastern Conference with an 11-15 record, the Magic look to build off of last night’s win. 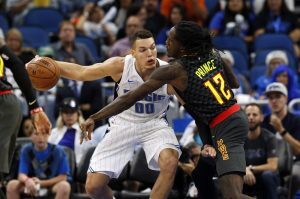 After trailing from the second quarter on, the Orlando Magic found themselves down by nine points early in the fourth quarter. 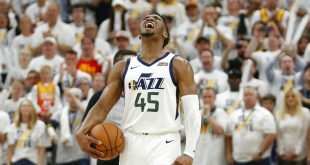 They were facing another loss and this time to the Atlanta Hawks who only had five wins on the season. After rallying back in the fourth, Orlando blew their one-point lead after failing to extend the lead. Suddenly, there were 14 seconds left on the clock, and they found themselves down by three points. That’s when a play from Jonathon Simmons to Nikola Vucevic, ended up with a pass to D.J. Augustin, who scored a three-pointer to tie the game and send it to overtime. In overtime, the Magic took the lead early with a steal and dunk from Elfrid Payton. 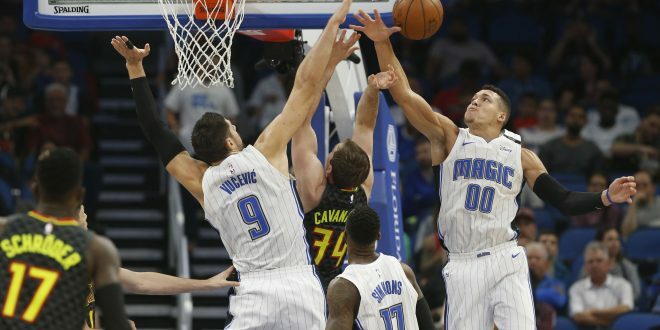 Vucevic and Aaron Gordon combined to keep the Magic’s lead and win the game. Both players finished the game with a double-double. Aaron Gordon finished with 24 points and 15 rebounds while Nikola Vucevic totaled 22 points and 16 rebounds. Point-guard Evan Fournier led the team with a total 27 points. 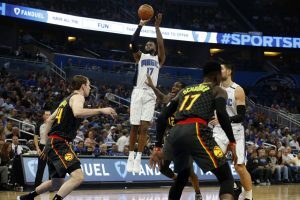 It was difficult for the Magic to celebrate their hard-fought win after Evan Fournier went down injured in the first play of overtime. He went down with an injury to his right ankle and left the match immediately after. 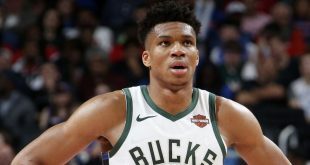 Initial X-rays came back negative, and Orlando has stated it was diagnosed an ankle sprain. Fournier has yet to have an MRI, so the severity of the sprain is unknown. 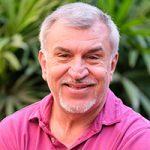 However, Orlando has listed Fournier as out for the match against the Denver Nuggets this Friday. Fournier has been the Magic’s second-leading scorer so far this season. He led the team in points in last night’s win against the Hawks until he went down injured. He is averaging 18.0 points and 3.2 rebounds. The team is hoping that the MRI does not show too much damage and that Fournier won’t be out too long. Until then, the Magic will now have to look at their bench for a replacement for Fournier at shooting guard. 32-year old Arron Afflalo will potentially get the start this Friday. 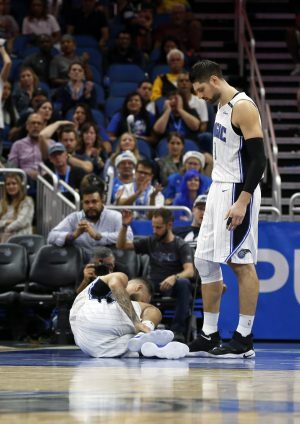 Orlando will have to do without Evan Fournier, at least for this Friday. 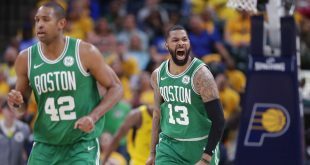 They will stay at home as they host the Denver Nuggets at 7 p.m. Following that match-up, the Magic will be on the road to Atlanta to take on the Hawks for the second time in four days on Saturday at 7:30 p.m.